I looked outside last weekend and saw apples on the ground under the tree in my yard. Apparently though, this year wasn’t a good year for apples because they were all small and wormy. I was disappointed but I still wanted to make my fruit tart, so I used some store bought apples that I had in the fridge. Not as good as fresh but still tasty–maybe next year will be a good apple year. This tart reminds me of dessert pizza, which I happen to love. So much so that the next day only half the tart was left, and since Morgan and Lindsey were coming over to eat I needed to make something else for dessert. Since the puff pastry comes 2 sheets to a pack, I decided to make another tart but using blueberry filling rather than apple. I think I liked the blueberry even more than the apple. If you don’t have an awesome cousin (like I do) that will buy you a tart pan, you could just shape the dough and bake on a cookie sheet. 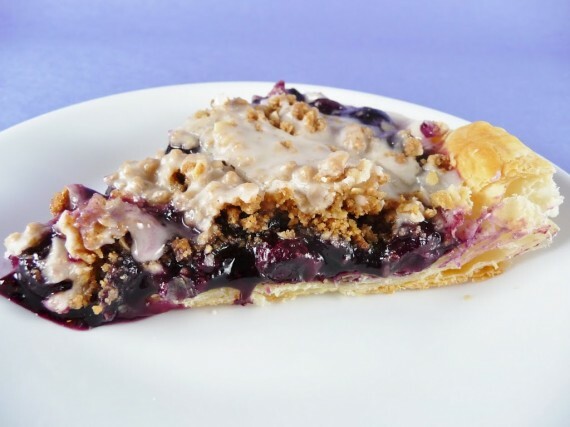 And if you double the crumble topping, you can use half on one flavor of the fruit tart and then store the remaining cooled crumbs in a ziploc bag for several days and make the other flavor. 3 reasons to love Fall: apple season, awesome running weather, and my birthday! Enjoy! Shape to fit 9 inch tart pan (you will have to roll slightly with rolling pin). Press lightly and poke several holes in bottom with fork. Bake at 400 degrees for 15-20 minutes or until golden brown. Combine blueberries and sugar in medium saucepan over medium heat. Combine reserved juice with cornstarch. When berries begin to boil, whisk in cornstarch mixture and continue to whisk until thick. Remove from heat and cool. Melt butter in skillet over medium heat. Add apples and saute for about 10 minutes or until apples are slightly softened. Add brown sugar and cook for 2-3 minutes more. Remove from heat and cool completely. Combine oats, brown sugar, flour, and cinnamon. Add butter and cut in with pastry blender. Pour mixture onto parchment lined cookie sheet and bake at 400 for 5-10 minutes or until golden brown. Break up slightly and cool completely. Whisk powdered sugar, vanilla, and almond extract together. Add milk 1 tbsp at a time until you reach a consistency that can be drizzled. Spread filling over pastry. Top with crumble and drizzle with glaze.